The U.S. war in Afghanistan is supposed to be winding down. Its contractor-led drug war? Not so much. 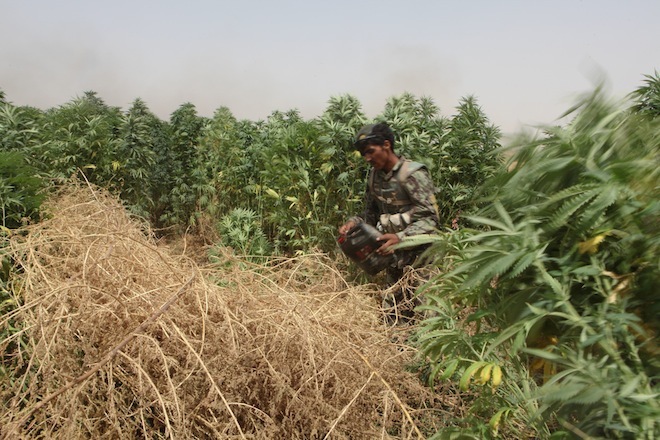 Inside a compound in Kabul called Camp Integrity, the Pentagon stations a small group of officers to oversee the U.S. military’s various operations to curb the spread of Afghanistan’s cash crops of heroin and marijuana, which help line the Taliban’s pockets. Only Camp Integrity isn’t a U.S. military base at all. It’s the 10-acre Afghanistan headquarters of the private security company formerly known as Blackwater. Those officers work for an obscure Pentagon agency called the Counter Narco-Terrorism Program Office, or CNTPO. Quietly, it’s grown into one of the biggest dispensers of cash for private security contractors in the entire U.S. government: One pile of contracts last year from CNTPO was worth more than $3 billion. And it sees a future for itself in Afghanistan over the long haul. Earlier this month, a U.S. government solicitation sought to hire a security firm to help CNTPO “maintain a basic, operational support cell” in Kabul. Army Lt. Col. James Gregory, a Pentagon spokesman, explains that “cell” doesn’t kick in the doors of any Afghan narco-kingpins. 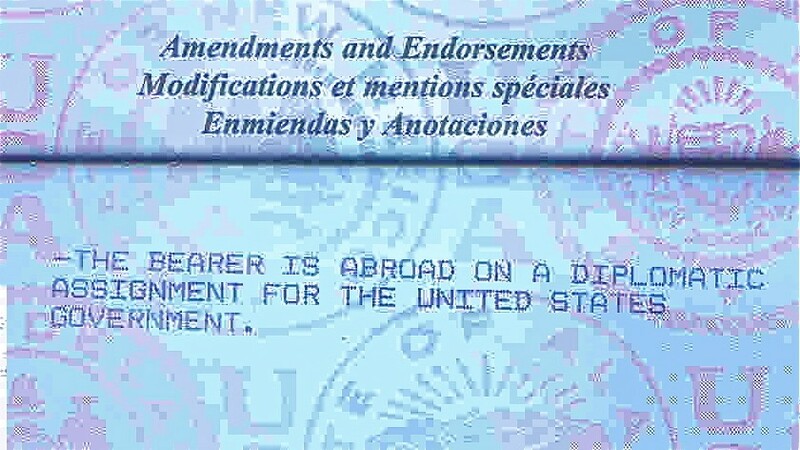 It handles the more mundane tasks of overseeing the contracts of the Pentagon’s counter-narcotics programs, from “training and linguists, and [providing] supplies, such as vehicles and equipment.” The solicitation, however, indicates those services aren’t going anywhere: When all the options are exercised, the contract extends through September 29, 2015, over a year past the date when Afghan soldiers and cops are supposed to take over the war. And the “government preferred location” to base CNTPO? Camp Integrity. violations of the Arms Export Control Act and the International Trafficking in Arms Regulations. “For an extended period of time, Academi / Blackwater operated in a manner which demonstrated systemic disregard for U.S. Government laws and regulations. Today’s announcement should serve as a warning to others that allegations of wrongdoing will be aggressively investigated,” said Chris Briese, Special Agent in Charge of the Charlotte Division of the FBI. “This company clearly violated U.S. laws by exporting sensitive technical data and unauthorized defense services to a host of countries around the world,” said Brock D. Nicholson, Special Agent in Charge of U.S. Immigration and Customs Enforcement (ICE) Homeland Security Investigations (HSI) Atlanta. “In doing so, company employees were frequently in possession of illegal firearms and aided other foreign nationals in the acquisition of illegal firearms. HSI is proud to have played a role in assisting the investigation to call this company to account for its actions.” Nicholson oversees HSI activities in Georgia and the Carolinas. The government security contractor formerly known as Blackwater Worldwide has admitted to the key facts behind 17 federal criminal charges, including illegal exports and unauthorized possession of automatic weapons, as part of an effort to end a long-running investigation into the firm’s conduct. Blackwater, now known as Academi LLC, agreed to pay a $7.5 million fine on top of a $42 million settlement it reached earlier regarding civil arms export violations. Some of the charges relate to Blackwater’s possession of machine guns at a training compound in North Carolina. More on the company’s deferred prosecution agreement here from the Associated Press. RALEIGH, N.C. — The international security contractor formerly known as Blackwater has agreed to pay a $7.5 million fine to settle federal criminal charges related to arms smuggling and other crimes. Documents unsealed Tuesday in a U.S. District Court in North Carolina said the company, now called Academi LLC, agreed to pay the fine as part of a deferred prosecution agreement to settle 17 violations. The list includes possessing automatic weapons in the United States without registration, lying to federal firearms regulators about weapons provided to the king of Jordan, passing secret plans for armored personnel carriers to Sweden and Denmark and illegally shipping body armor overseas. Federal prosecutors said it settles a long and complex case against the company, which has held billions in U.S. security contracts in Iraq and Afghanistan. 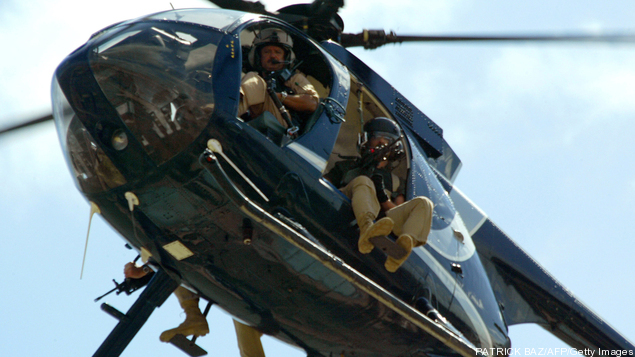 The Justice Department plans to bring a new indictment against four Blackwater Worldwide guards involved in a 2007 shooting that killed 17 Iraqis. U.S. District Judge Ricardo Urbina had thrown out the case in 2009, but an appeals court reinstated the charges last year. Urbina, who has since retired, said prosecutors built their case on sworn statements the guards had given under a promise of immunity. A Justice Department attorney told Judge Royce Lamberth on Wednesday that a special team will ensure that prosecutors working on the new indictment don’t have access to “privileged statements.” Prosecutors say they will seek a superseding indictment after gathering additional evidence. 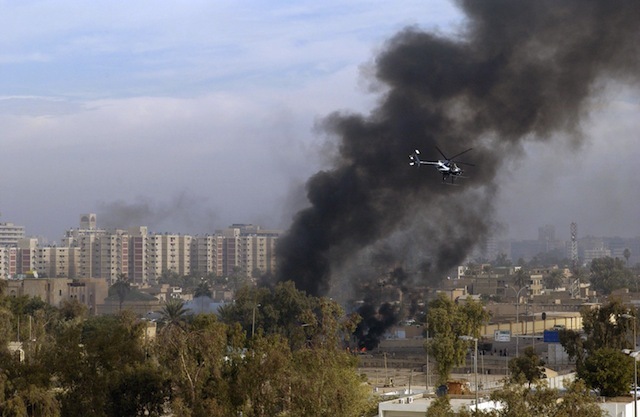 The guards are accused of opening fire in a crowded Baghdad intersection in 2007. The security firm once known as Blackwater has repeatedly tried to distance itself from its bad old days of wrongful death and corporate misconduct. But a new lawsuit filed by two former employees raises questions about whether the firm’s kinder, gentler rebranding is more than skin deep. Two former employees of the firm, now called Academi, say that they were fired from their jobs in Afghanistan after blowing the whistle on an attempt by a colleague to falsify dozens of marksmanship tests for security contractors. Robert Winston and Allen Wheeler thought that they were following Academi’s new ethics guidelines, which require employees to report suspected instances of waste, fraud and abuse. But not only were Winston and Wheeler fired, they allege Academi arranged with the State Department to blacklist the two security contractors from finding future work with private security firms. According to the lawsuit, which Nation reporter Jeremy Scahill first tweeted about on Thursday, Winston and Wheeler witnessed a fellow firearms instructor twice fail to record the results of shotgun and machine-gun training amongst dozens of Colombian employees of Academi. The State Department, which hires Academi to protect its diplomats in conflict zones, requires weapons certification from the guards: If contractors can’t properly fire their weapons, they’re a danger to diplomats in need of protection and innocent civilians nearby. But on two occasions in March 2012, Winston and Wheeler say that instructor Timothy Enlow informed the State Department inaccurately that Academi’s guards were proficient with shotguns and machine guns. On the second occasion, Enlow failed to bring an M249 belt-fed machine gun to the test range near Kabul, but reported a successful test anyway. Academi plans to build a 235-bed lodge at its Moyock, N.C.,-based compound with plans to expand operations where it trains military and law enforcement personnel how to shoot better under stress, protect officials from terrorist attacks, and storm criminal hideouts, among other things. The $3.2 million lodge is the largest expansion of facilities on the 7,000-acre compound in at least four years. It comes after a tumultuous period during which the company name changed twice and management rolled over. Formerly known as Blackwater, Academi is the largest taxpayer in Camden County. With about 250 workers on site, it also is the largest private employer in the county, where most its facilities are based. Academi Training Center, Moyock, N.C., was awarded a $17,448,051 firm-fixed-price contract. The award will provide for the security services in support of Forward Operating Base (FOB) Dwyer, and an option for FOB Delaram II. Work will be performed in Afghanistan, with an estimated completion date of May 22, 2016. The bid was solicited through the Internet, with 12 bids received. The Rock Island Contracting Center, Rock Island, Ill., is the contracting activity (W560MY-12-C-0006). How confident is the new management at private security contractor ACADEMI — formerly known as Xe and, also, infamously, as Blackwater — that they’ve turned the company around? Last month, apparently without attracting any public attention (until now), they quietly bought another security firm, International Development Solutions, and took over its piece of the State Department’s $10 billion World Protective Services contract, which then-Blackwater got kicked out of years ago. And ACADEMI plans on further acquisitions, CEO Ted Wright confirmed in an exclusive interview with AOL Defense. The company has spent a year rebuilding and is set to grow again, said Wright, who took over in June 2011. (He was hired by a new ownership team that bought out Blackwater founder Erik Prince the previous December). “The things we said we were going to do a year ago, we’ve kind of done,” said Wright, just back from visiting employees in Afghanistan. Since he started, the company has not only a new name but a new management team, a new board of directors — in fact it didn’t even have a board before — and a new corporate headquarters in Arlington, looking across the Potomac River straight at the headquarters of the State Department. Many of the employees doing security work in the field are new, Wright said, and the core of ACADEMI’s business, its training cadre, has turned over almost completely: Only about 10 instructors remain from the old days, compared to 30 new hires, with another 20 on the way. Another Defense Base Act PTSD failure. Dale McIntosh stands with children in Central America. McIntosh did private security work in Iraq and Afghanistan. Dale McIntosh was no stranger to death. When it wasn’t everywhere around him, it was a constant threat, something that kept him literally looking over his shoulder for months at a time. A former Marine, he hired himself out as a privately contracted bodyguard in the Middle East, where he lived on the edge and saw and did things so terrible that it haunted him. He survived firefights, ambushes, exploding cars, road mines, snipers and rocket-propelled grenades. In the end, he escaped without any wounds, or at least none we could see. When he returned, he seemed to be the Dale that his friends remembered — charming, gregarious, warm, outgoing — but inside, he was hurting and disturbed. McIntosh brought demons home with him. After graduating from Utah State, Dale served five years in the Marines — part of it in special ops — but felt unfulfilled because he never saw action. He compared it to being an athlete who never got in the game. Eager to use his military skills and see action, he signed on to do private security work. 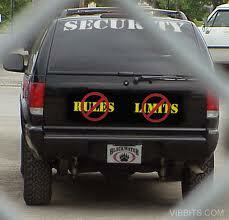 At the time, there was a big demand for security firms, the most famous and controversial of which was Blackwater. With a shortage of manpower, the U.S. government hired the firms to protect American interests and personnel in the Middle East. They were largely ungoverned by law, which did not make them popular at home or abroad. 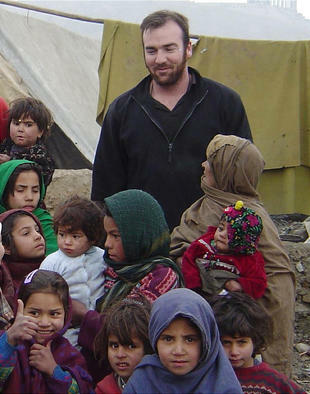 McIntosh spent six months in Afghanistan, five months in Iraq, two months in Bosnia and then another two months in Iraq before returning to Utah in the fall of 2005. Supreme Court on Monday rejected an appeal by four Blackwater Worldwide security guards who argued prosecutors made improper use of their statements to investigators in charging them with killing 14 Iraqi civilians in 2007. The justices refused to review a ruling by a U.S. appeals court in Washington, D.C., that reinstated the criminal charges against the guards for their roles in the Baghdad shooting that outraged Iraqis and strained ties between the two nations. 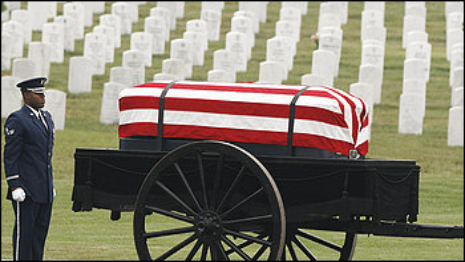 The shooting occurred as the guards, U.S. State Department security contractors, escorted a heavily armed four-truck convoy of U.S. diplomats through the Iraqi capital on September 16, 2007. The guards, U.S. military veterans, responded to a car bombing when gunfire erupted at a busy intersection. The guards told State Department investigators they opened fire in self-defense, but prosecutors said the shooting was an unprovoked attack on civilians. Several other lawsuits filed by Contractor Employers will expose the extent to which Civilian Contractors were actually working for the CIA and the State Department in capacities that are not known to the public. It is known that Ronco Consulting has worked for/with the CIA via the State Department . Blackwater/Academi has banked more than $2 billion from security and training contracts with various federal agencies, including the CIA, since 2002. Several former CIA officials later went to work for the company. It was a CIA operation. In court papers filed last month in Raleigh, the defendants say the gift of five guns to King Abdullah II of Jordan during a royal visit to Blackwater’s Moyock, N.C., headquarters in March 2005 was requested, directed and authorized by the Central Intelligence Agency. Attorneys for the five have filed declarations from two retired CIA officials, including a former Jordan station chief, who say they are familiar with the circumstances of the king’s visit and would be willing to testify about it. The CIA did not respond to a request for comment. It’s a new wrinkle in a case that dates to April 2010, when the five security company executives were indicted on a variety of felony firearms charges. One key section of the indictment involved King Abdullah’s 2005 visit to Moyock, during which the monarch was presented a Bushmaster M4 rifle, a Remington shotgun and three Glock handguns. WASHINGTON, DC (May 23, 2012) – Blackwater Industries, which changed its name to Xe Services, and now has changed it yet again to Academi LLC, lost its initial bid to have the $240 million suit for employee misclassification sent to arbitration and dismissed from federal court in Washington, D.C.
Scott Bloch filed an amended complaint (see link above) in the class action lawsuit on behalf of four former security specialists, who were injured while working for Blackwater, in order to recover their payment of social security, unemployment insurance, and unpaid benefits and state and local withholding and unemployment insurance, and other unspecified damages. The action seeks $240,000,000 in damages for lost benefits, overtime, treble damages and punitive damages, as well as additional amounts as proved for the class of specialists. The court has rejected that motion filed by Blackwater and required it to file another motion to determine if the same Plaintiffs agreed to have an arbitrator determine if the agreements were unconscionable, procured by duress, fraud and undue influence. Read Xe’s Arbitration Bid Denied in Misclassification Suit here. The press agency of Lebanon’s Hezbollah movement charged Wednesday that the CIA, Israel’s Mossad and private security firms have been exposed supporting Syrian rebels in Homs. MOYOCK, N.C. It’s new name is ACADEMI . However, many know it as the company formally called Blackwater USA. ACADEMI’s new owner wants to portray the company in a different light. In a direction, they claim, of more transparency. For the first time since the change of command, only 10 On Your Side was invited behind the gates of the ACADEMI training center in Moyock, North Carolina. At first glance the vast land is quiet and serene. There’s a meditation garden with a short path winding around a simple pond. At the garden’s entrance stands a child embracing the American flag. The silent symbolism is powerful. Mixed within the beautiful landscape are occasional bursts of gunfire. You also hear the squeal of car tires. Both are a reminder it’s work as usual during WAVY.com’s visit. On the track, head driving instructor Craig Stephens explained the importance of driving techniques. “I can use this car to save my life. And that’s what I basically train the guys here for,” Stephens said. The property consists of 7,000 acres sprawled across the border of North Carolina’s Camden and Currituck counties. Parts of it looks like a giant playground, a ropes course with a zip line and slide. There’s also a track where high speed turns are perfected. Every facility serves a specific purpose, often rooted in some past tragedy. There’s a mock town with a church and high school, which was built to train for and respond to massacres like Columbine and Virginia Tech.